How to stand in golf is known by the term of stance. Stance relies on a stick is used. Starting with a narrow foot distance and somewhat open to wedge a stick, widening the distance and not aligned with the target. Change happens because the position of the right leg continues to shift according to length rod used. Initially, place the heel of your left leg straight with the ball. The left foot is stationary, while the set is the right foots a comfortable distance. Typically, the distances between the two legs do not exceed the width of the shoulders. For drivers, the stick that is used the drive swing; his stance is perpendicular to the target and the distance a leg span of approximately shoulder width apart. A stance that really lets you can put on the whole body to provide balance on each stick you use. In addition to both feet, the technique of stance is emphasizing on the head. The position of your head should not move backward or forward, as well as up or down. When moving in this direction, the control of your blow will disappear. Chief described as the center of rotation of the punches are going to do. 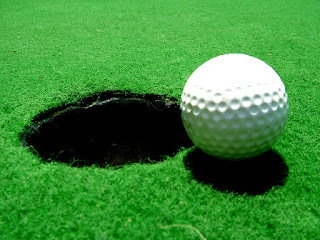 Whatever your goal to play golf, how good is your game, the result of the game is always up and down. It depends on your mastery of the basics of the game of golf. According to Jack Nicklaus, an American golfer, accuracy cannot be replaced by anything, because he always stressed the importance of mastering the basics. The accuracy starts on the hands, or rather grip (the way the hand holding the stick). It is not a matter which method you choose; the clear grip is the key to a good swing to score. The following kinds of grip by Jack Nicklaus are in his book Towards a Better Golf Game. This style is also called interlocking. Its use is associated with the left hand index finger right hand little finger. It usually used by people, who have small hands. This force is also overlapping. Pinkie right hand placed in his left hand between the index and middle fingers. The difference in interlocking style is, there are no interlocking fingers, and they just squash it. The tenth digit is placed directly on the stick. After studying and trying these types of grip, pick a style that fits of you or according to your coach. Then, use the grip constantly, never to be replaced. Good luck!